music to put a smile on your face!! Pete Smyser (7 string guitarist) and Ted Lis (saxophonist) are a truly unique duo that is wildly popular at many of the areas finest retirement communities. They perform a vast repertoire of nearly 1000 songs centered around the "Great American Songbook" (melodies by the likes of Gershwin, Jerome Kern, Irving Berlin, Cole Porter, etc.). These are the songs of stage and screen that defined popular American music from 1900 through the 1960’s. Hits made famous by such icons as Bing Crosby, Judy Garland, Fred Astaire, Sinatra, Dean Martin, The Andrews Sisters, Nat King Cole, Ella Fitzgerald and other legendary entertainers. Pete and Ted’s performances exude pure joy and romance with a healthy dose of Nostalgia. The smiles beaming on their faces reveal that love what they do and thrive on connecting with their audience. 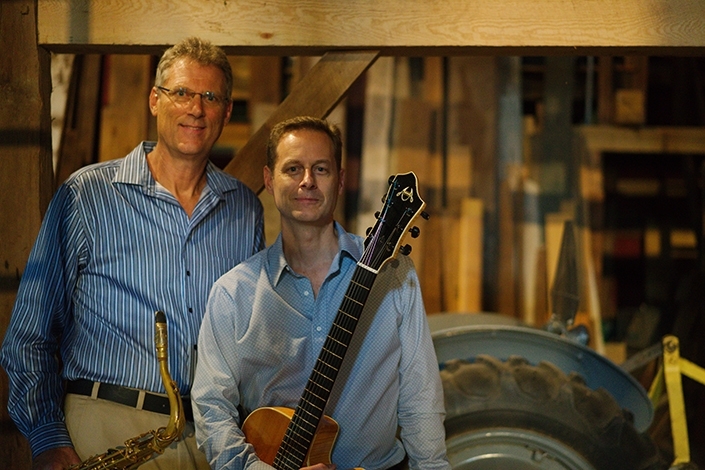 The duo has been performing together for over 20 years providing music for concerts, jazz clubs, restaurants, corporate gatherings, country clubs, weddings and other public and private functions. They currently provide music at Shannondell (Audubon, PA), The Hill at Whitemarsh (Lafayette Hill, PA), Waverly Heights (Gladwyne, PA), Foulkeways (Gwynedd, PA), Jenner’s Pond (West Grove, PA), Dunwoody Village (Newtown Square, PA), Homestead Village (Lancaster, PA), Meadowood (Blue Bell, PA), numerous ACTS communities, Pine Run (Doylestown, PA), Freedom Village (West Brandywine, PA), Willow Valley (Lancaster, PA), Woodland Heights (Narvon, PA), Luther Acres (Lititz, PA) and The Café (Bethlehem, PA). *Discounts are sometimes offered when booking for 2 or more performance dates at the same venue within a calendar year. Suggested Subject - "Inquiry regarding pricing and availability"